Lincoln Square has turned into an unlikely tourist attraction, with a crowd of people holding their mobile phones up to get a picture of Abraham Lincoln gone bling. The statue that gives the small square on Brazenose Street (incidentally, one of my favourite street names) its name hitherto only stood out for its unusually large head. Now, the head has been accentuated even more by a puffed up 'NY' New York Yankees style hat with red cloth of an indeterminate purpose trailing out of it. A grave looking President Lincoln also sports some hip-hop bling around his neck, including a large gold medallion proclaiming ‘Union’ (as in, the Northern states of the Union versus the secessionist Southern States, back in American history). To top it all off, he’s given a bit of street attitude by large rings almost the size of his hands which tell us he’s a ‘true Yank’. The effect is as comical as you can imagine. Obviously noone told the MEN, who in today's edition said “mystery surrounds who has given the statue the makeover”, that the stunt wasn't a work of an anonymous graffiti artist. It’s the doing of the American street artist Leon Reid IV and was commissioned by URBIS as part of their exhibition State of the Art: New York, which starts next week and will celebrate the city's vibrant art scene. An interviewee in the same article - who is clearly completely devoid of a sense of humour - said: "I'm not quite sure what it's supposed to say. It's supposed to be modern art. They've turned it into some kind of African gangster statue. I don't particularly like it. It looks very strange. Apparently they had a crane. I don't like it. It's insulting. I think it looks really daft." He’s spectacularly missed the point. The African map hanging from his neck is a reference to Lincoln’s work to stop the slade trade during the American Civil War of the 1860s. Lincoln was supported by Manchester in his opposition to the slave trade - yet another example of Manchester as a politically radical, forward thinking city, which is why there is a statue of Abraham Lincoln in Manchester in the first place. Or maybe he's choosing not to see the point, seeing as we're also told this at the bottom of the statue, which acknowledges ‘the support that the working people of Manchester gave in the fight for the abolition of slavery during the American civil war'. The statue was placed in the square in 1986, in a fairly tucked away location (considering Brazenose Street's proximity to the Town Hall and the prominence of the statues in Albert Square). I, for one, had to do a double take when I went to the Post Office on Brazenose Street this afternoon. It definitely brightened up my grey afternoon as well as, I'm guessing, that of the office workers who eat lunch in the square every day. It's a thought provoking bit of modernisation, and you can't ignore the influence the past has had on our times. You may also enjoy Jonathan Schofield's article on the history of the statue, which was written to coincide with Barack Obama's election as president. "the only link I can see between Lincoln and Hip Hop "culture" is that so many gangsta rappers were also shot dead. Judging by the arc that Hip Hop has taken over the last 30 years, are we also to assume that Mr Lincoln started out as charting social conscience and decrying the plight of the black man in America but over the years became more interested in perpetuating the stereotype of the violent, money-obsessed, misogynist homophobe? MANCHESTER’S smallest art gallery will be offering a close-up glimpse at the work of a local artist this weekend. On Saturday and Sunday, the miniscule SHED gallery in Levenshulme - which, as the name suggests, is housed in a garden shed - will allow visitors to peek into the latest sketch book of Longsight based artist Annette Ebanks, entitled Flower Power. Ebanks will also be showing colourful canvases worked with different drawing techniques, including oil pastel, collage and charcoal, at the unique gallery, which is situated at the Tonbridge Road Allotments in Levenshulme. Visitors will also be able to flick through Ebanks’ last sketch book, African Masks, which was published by Manchester’s Slap-Dash Books, as well as meet the artist on both days. Ebanks, who has a history in textile design, exhibited prints in the café at the Whitworth Art Gallery last year. Her expressive art, based around plants and flowers, will be accompanied by home grown vegetables on Sunday, as the allotments will also be throwing the gates open to the public for their Spring Open Day. As well as being an opportunity to browse art in the open air at the Gallery’s first show of the year, there will be activities and demonstrations for all the family, provided by The Community Allotment Project. The exhibition is being held by Pool Arts, a community arts organisation that formed in 1999 to give local people access to the resources and space to make art. Pool Arts is based at St Luke’s Church in Longsight. I've only recently started going to exhibitions at CUBE (Centre for the Urban Built Environment), following their really interesting Yellow Space show, and I really enjoyed their new exhibition of work by the photographer John Davies. Taken between 1979 and 2005, John Davies' imposing black and white shots document a changing Britain. They trace the way both its natural landscape and urban centres have been changed forever by the processes of industrialisation and modernisation; the march of motorways across its hills and valleys, rebuilding of cities after the war and spread of 1960s office complexes and tower blocks, similar from town to town and city to city. This all seems to lead up to the exhibition's culminating photo, of the gleaming sprawl of the Trafford Centre and its million or so carparking spaces. A grubby grey box of a building, once voted among the ugliest in the country, stands awkwardly between ornate nineteenth century buildings in Newcastle, and the layers of Birmingham's New Street Station are depicted as a tangle of concrete. The way in which we influence our landscape is obvious, as is seen particularly in the shots of Welsh mines, but we’re left to reach our own conclusions about how the environment around us affects our lives. People are strangely absent from most of the photos, which either show the closed structures in which our lives are contained - the offices, multi-storey car parks and tower blocks where everyday events take place - or the traces left behind once these projects are abandoned and places exhausted. Partly because they're aerial shots, the photos are static and eerily quiet - when humans appear, as in one image where insignificant figures pick blackberries by an abandoned railway line, they’re almost quaint. From the toy town houses of Hulme, crisscrossed with roads like a town planner’s model, to a Stalybridge skyline dominated by mill towers and a hulking Stockport viaduct (accompanied by the necessary Engels quotes on urban deprivation), the built environment towers forebodingly, way above the level of human life. In a 1982 photo, the players in a football game are tiny specks in comparison to the massive Agecroft power station in Salford; it's almost as if they're there by accident. Even a horse, incongruously small and lost in the foreground, seems to be staring at it in awe. Four huge monolithic towers, blackened at the top, rise over everything for miles around and spill smoke into the air around them, as if to prove Davies’ point about man’s huge footprint on the world around us. 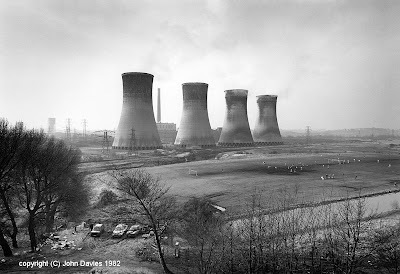 What is implicit in the often desolate emptiness of Davies’ photos is the way lives have been changed and uprooted to make way for the new, from slum clearance and the demolition of back to back houses to the programme of mine closure undertaken by the Conservative government. We’re shown the remnants of a community that was built up around Easingdon Colliery in County Durham and told, ironically, that the houses which survived featured in the film Billy Elliott and are now regarded as ‘classic’. 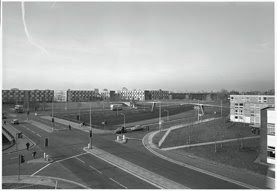 Hulme provides another example of how trends in urban living come round again like fashions; housing left over from the Industrial Revolution was knocked down to make way for sixties high rise housing estates, before being rebuilt as traditional low rise houses again in recent decades. Many of the scenes look old fashioned now, depicting a bygone way of life - for example, a shot of racing pigeon sheds overlooking Sheffield, and many of the buildings pictured, including Agecroft Power Station, are long since demolished. 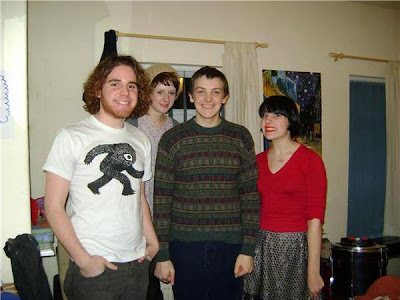 What links all the photos across the 30 year time span together is that they have an unusual beauty. A few photos of nature’s natural monoliths, the peaks and mountains of the Lake District, show Britain in its pure, unsullied, glory, but Davies’ shots seem to say that it's still majestic even after the intervention of man. "I think it's only fair to tell you I'm absolutely cuckoo"
An additional spring was put in my step yesterday during an already pleasant sun-inflected wander through the back streets of the Northern Quarter. These anonymous, unattributed, words, taken of course from the Magnetic Fields song Absolutely Cuckoo, leapt from a wall in cursive white on black. What better affirmation of the dawn of spring than this sprightly country lament, guitars like new green shoots and electronic effects a-burble over the teasing strums of a ukulele? Absolutely Cuckoo is the opening track on the Magnetic Fields' majestic three album box set 69 Love Songs, an ambitious concept album full of short, sweet, perfectly formed songs of love turned on its head, which is ten years old this year. Stephin Merritt's one-step-away-from-laughing baritone dances through skipping ropes of repeated rhyming couplets, which chase each other round and round like the words to a nursery rhyme. Absolutely Cuckoo also manages to sum up my entire relationship history in one minute and thirty five seconds. I've noticed that the graffiti has still been there every time I've been to my favourite fruit and vegetable stall (possibly called Fresh is Best, in the shacks opposite the Arndale Market). I saw today that it finally seems to have been painted over, but it lasted for over a month! The highlight of the absurdly overcrowded Manchester Histories Festival at the weekend - apart from being inside the Town Hall, amidst its nooks and crannies, mosaics, stained glass windows and Ford Madox Brown murals - was a talk by the former Hacienda DJ, XFM presenter, lecturer and writer Dave Haslam, based on his book Manchester, England. 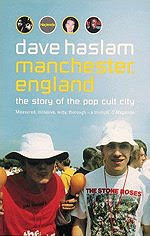 I haven’t read the book - which Haslam describes as a “biography” of the city, Manchester in his mind being akin to a person with its own “psyche” and “personality traits” - but I’d like to. Haslam describes Manchester as a “hybrid city”, its population constantly changing and absorbing immigrants throughout the centuries, from those seeking work and better life during the industrial revolution to the annual influx of students. Haslam himself moved to Manchester relatively late, but exudes a love of the city. The most important of Manchester’s character traits, says Haslam, is its famed “self-assertiveness”. This can be seen in its history of producing radical thinkers, social movements and, in the latter half of the twentieth century, popular culture that has spoken out as a voice for change. Perhaps because of its second city status, Haslam suggests Manchester has always attracted the ‘other’, been a "location for the alternative", and it’s this sense of “distance and difference”, its autonomy from London and the fact that it’s a long way from the locus of political power and the media centre, that allows countercultures to thrive. That’s why Manchester has historically had a strong DIY element - you make your own entertainment. Although the talk is wittily entitled ‘From Engels to Elbow’, this seems to be mainly an alliterative device as Engels is more dwelled upon than Elbow. Haslam has a knack for catchy sound bites, also helpfully reducing the theme of his lecture to the link between "chart hits and Chartists". For Haslam, "pop culture is a necessity”. The fact the talk takes place in the council chamber of the town hall, underneath the Manchester coat of arms and Concilio et Labore motto, shows how much pop culture has become part of the establishment. Haslam is trying to ensure pop sociology is accorded the same importance as what we normally think of as worthy of inclusion in the history books. His talk draws the not often made link between Victorian Manchester and the music scene that culminated in Madchester which, it seems, are more similar than you might think. He tells us Victorians “lived their lives on the streets”, debating on street corners, pamphleteering and registering protest through strikes. Victorian Manchester was “awash with ideas”. Reading out Engels’s description of a hedonistic Saturday night on the streets of Manchester, Haslam notes that the excesses of today’s Saturday nights wouldn’t have been out of place in Victorian times - it seems the Victorians, too, were 24 hour party people. Surprisingly, Haslam considers that the Victorians would have valued nightclubs as a place for “interaction”, as opposed to our society’s “retreat into the private realm”. Manchester was a birthplace of the punk movement, which Haslam sums up as the “desire to be heard”. We need rebel yells, he says, because “the alternative to being heard is silence”. Haslam isn’t so much claiming that Manchester is an inherently musical city, though, with sounds rising spontaneously from its city fabric, more that the famous art it came to be associated with arose out of its many problems. From the overcrowding of Ancoats to the failed Utopianism of the Hulme crescents, out of alienation came creativity. To Haslam, pop music is so important because it allowed the unlikely alliance of “arty weirdo types and tough kids” . Often, those whose art has become associated with Manchester and Salford wrote as a criticism, from the authors Anthony Burgess and Elizabeth Gaskell - whose novel Mary Barton is an expose of the conditions of the working classes - to the sparse music of Magazine. Shelagh Delaney’s 1958 play Taste of Honey, which on its release was the subject of front page outrage at its honest depiction of Salford life, is cast as a precursor to punk rock with its "no barriers", “back to basics" depiction of reality. Some of the audience react with shock when Haslam compares the formation of Factory Records to the foundation of the Anti Corn League, but you can kind of see his point. Tony Wilson is described as “an enablist, a propagandist and a conduit”, and that’s it - Factory records may not have made great political statements, but it was the Manchester music scene and Hacienda that put Manchester back in people’s minds and attracted people to return to the city during the bleak Thatcher years, despite Thatcher's best efforts to marginalise the city. When asked by a member of the audience what the next big thing might be, Haslam acknowledges the absurdity of a 47 year old presuming to predict the future of pop music. Another listener asks how Haslam thinks the recession will affect the Manchester scene. Haslam is critical of contemporary Manchester, which is “property developed to death” and “neutered by big business”. If the message of the talk is that great art arises from an admission that things are “not perfect”, and the need for something to “rebel against” and “escape from”, it seems likely the next big thing will arise through the cracks of the consumer dream. While we’ve been accumulating more and more mass produced possessions and our high streets have become increasingly similar, it seems a quiet revolution has been taking place. Rather than advocating violence or smashing up the system, its weapons are knit bombing and crochet, and a return to traditional crafts. 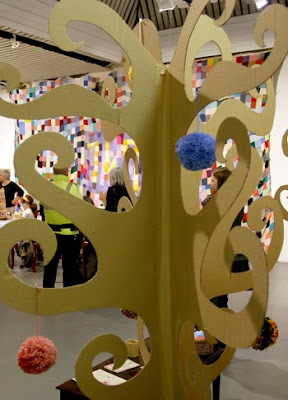 Far from being outdated or old fashioned, though, the UK DIY exhibition at the Turnpike Gallery shows the place so called craftivism has in the modern world. Instead of being made obsolete by our ever more technology driven society, the internet has allowed craft to thrive. Creative projects around the world can connect with each other through blogs, online communities and online shops. The exhibition, which celebrates the way in which craft is bringing back colour and individuality to the world around us, starts outside the gallery, with Manchester guerilla knitting duo ArtYarn’s tree encasing knitting, which gives trunks the appearance of bumblebees. Inside, artworks climb off the walls, take over the floors and hang from the ceilings of the gallery. It’s an inverted world, where throwaway consumer culture doesn’t exist. Students from Manchester Metropolitan University put everyday materials to new, innovative uses, from necklaces made from tights to a candelabrum fashioned from mirrors and sink strainers. Unwanted furniture and glass bottles find new lives, as do aluminium drinks cans turned into flowers. Drinking straw sculptures burst from the walls and hang from the ceiling resembling straw rooves and afros. Recycled skirts become a rag rug, reflecting the fact that 12 million tonnes of textiles are disposed of unethically in the UK every year. The message of the exhibition is waste not, want not. Seedpod-like knitted balls and spirals hang from the ceiling. Knitted organisms, such as Anita Bruce’s delicate white, orange and purple crochet virus, seem alive and bulblike, about to burst into life. A knitted landscape subverts expectations of what you’d expect to find in a gallery. Even the architecture is transformed: a plain pillar is clothed in what looks like a huge dog jumper, buttoned at the front, decorated with mosaic like patterns in lurid neon wool. Craft goes far beyond the beautiful and useful, however. There’s a strong political vein - what artist Rockpool Candy describes as ‘fibre activism’ - running through the work on show, from a film of a tank knitted as a protest against the Iraq war to the reappropriation of cross stitch to convey such slogans as Thug Life. Eva Broadhurst and Lucy Semper’s animated film Making the Most protests about Leigh’s lack of basic amenities like a train station, theatre or cinema. Faythe Levine’s film Handmade Nation, which we’re invited to watch through red, fluffy headphones, sums up DIY as a “lifestyle choice”, interviewing women who are keeping alive craft traditions and starting up their own businesses. DIY, they explain, offers the chance to “create your own economy”. Aptly for a film based in Olympia in the United States, home of the feminist punk movement Riot Grrl, the women are empowered by DIY as it proves “everything is possible”. What many of the artists featured in the DIY exhibition have in common is a resistance to globalisation. 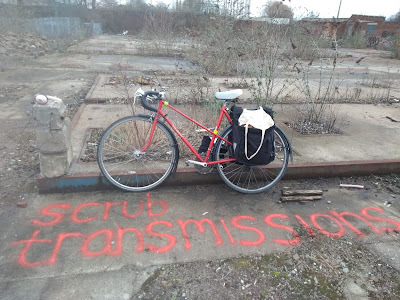 DIY is a prime example of “people versus the machine”, offering the opportunity to “create your own culture” and “regain control of your life as opposed to having a corporation feed you culture”. The exhibition isn’t just a celebration of craft, but of the whole DIY aesthetic, notably fanzines. Journalism is in a state of great change, not least in how we get our news and information. With the rise of citizen journalism and blogs, anyone can have a go. UK DIY reminds us, though, that there’s still something magical about the printed page and fanzines that blogs and websites will never replicate. Right down to the paper on which they’re printed, fanzines are a labour of love, an artistic child onto which is projected all the hopes, interests and ambitions of their creator. Fanzines are often intricately worked - the very opposite of the immediacy of our fast culture, in which news is out of date as soon as it’s published. They range from the professional and book like to traditional typed or handwritten sheets grainy from the photocopier, and take in topics as diverse as the brilliantly titled Zine from the Imagination of a Ladysnail to Leeds zine Scratch that Itch, which recommends eating out of bins as a protest against our throwaway culture. Some, such as those made by Manchester based New Think Books, are mini works of art. Elizabeth Dunning, from Preston, encloses her zine Any Old How in an embroidered 7” record sleeve, whereas others fold out or pop up. Although some of the zines have online versions, there’s something about the look, smell and touch of the paper, whether shiny or matt, textured or smooth, opaque or tracing paper, that a computer screen is never going to capture. Whether diaries allowing insights into the maker’s life or travel zines, all are born from the passion of whoever made them. The wonderful Don't Forget to Dance music zine typifies the obsessive approach to popular culture that motivates zines, pointing out that in fact it's often fairly niche 'unpopular culture'. Sugar Paper Zine, which details things to make and do, contains a cut out, dress up doll and recipes. The exhibition allows anyone to have a go, from tables dedicated to making jewellery and looms from plastic packaging to an invitation to embroider your name on cushions. Pom Pom International provide the instructions and materials to make a pom pom, which can then be hung on a pom pom tree. The pom poms will eventually be put towards the world’s biggest pom pom for peace. Buses run from Manchester Shudehill Interchange and Piccadilly Gardens to Leigh every half hour or so, and take about an hour. 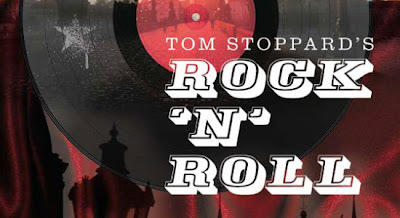 Czech born playwright Tom Stoppard’s latest play is a curious mixture of highbrow and popular culture, intellectualism and an unshakeable belief in Rock n Roll. We all know that popular music at its best has been a form of rebellion against the time in which it was made, yet the heavy handed manner with which Stoppard treats the subject in Rock n Roll doesn’t quite work. Taking place over the course of 22 years, from 1968 to 1990, Rock n Roll charts the friendship of two friends. Graeme Hawley’s Jan, a Czech brought up in England, is studying at Cambridge for the summer and befriends Max (played by Hilton McRae) an ageing academic who was born in the same year as the October Revolution of 1917 and refuses to give up his membership of the British Communist Party. Although at first they seem similar, the play documents the way Jan and Max’s lives diverge and are shaped by the different events that befall them. We meet Jan, a pop music anorak, as he is just about to return to Prague to ‘save rock n roll’ following the Russian invasion of the city. As far as Max is concerned, given a choice between locking rock musicians up in prison or giving them loads of money, he knows which he’d prefer. The action takes place between Max’s Cambridge home and Jan’s apartment in Prague. The different cities are flicked between like records in a jukebox, and are accompanied by music from each year, from the sinister snarl of the Velvet Underground to the sunshine pop of the Beach Boys. Jan’s idea of rebellion is to sit back and do nothing: in his eyes, to grow your hair is to rebel against the dominant norms of the time. Though ostensibly a socialist, his idea of freedom is very different to Max’s. Max’s idea of freedom is for the workers to have the ‘freedom to have a chance’. Jan merely desires ‘freedom to be left alone’. Jan rails against heroism, reasoning heretics merely reaffirm the beliefs of the bearers of the faith. As long as he has his impressive array of American and English records, he’s happy to sit inside whilst freedoms are gradually eroded outside. Jan’s subversive heroes are the Czech band Plastic People of the Universe, who make ‘socially negative music’ in the eyes of the authorities. The Plastic People, according to Jan, epitomise the rock n roll ideal by biting the head off a chicken, Western rock style. Jan is contrasted with his friend Ferdinand, modelled on Vaclav Havel, first president of the Czech Republic. Ferdinand is an intellectual who pays Jan regular visits with a never ending supply of petitions against the imprisonment of those who speak out against the system, including members of dissident groups such as Charter 77. To Jan, these are empty gestures. Of course, it turns out that neither is entirely right. Rock music can subvert the system, or at the very least inspire others to fight for change. Jan is also wrong about being free from state interference. As the high ideals that shape the start of the play give way to pessimism and hardship, Jan describes the police brutality against those who challenge the state by attending rock concerts. When Jan himself is arrested and has his head shaved in prison, it's one of Ferdinand's petitions that gets him out. The main problem with Rock n Roll is there are too many different ideas to take in, and ideological discussion takes precedence over character. None of the characters quite seem real, more composites of stereotypes: snotty intellectuals and stroppy teenagers sitting round smoking weed. One character even trots out the expression ‘If you can remember the sixties you weren’t really there’. A satire of the newspaper industry and the way in which the world around us is presented works a little better, though: the real villains of the play are the press hounds who sniff around for the whichever side of the Velvet Revolution will be most unit shifting and pick the carcass of a fallen from grace Syd Barrett. Max’s continued endorsement of press censorship, the idea of curtailing freedom of expression as the people don’t know what’s best for them, is the most revealing admission that he knows his ideological position is insecure. It’s a shame that the most fully realised characters in the play are the women, yet they fade into the background, playing second fiddle to the men around them. Cate Hamer’s Eleanor, Max’s classicist scholar wife, is killed off by cancer well before the end of the play. A monologue in which she wails “I am not my body, my body is not me”, could be an advertisement for the feminist movement. This says a lot about the failure of Marxism and communism in the modern world - there were other issues to replace it such as feminism and anti-racism. Leila Crerar’s Lenka is another passionate female academic who is the most engaging character in the play, but again she is allowed little chance to develop, used only as a foil to criticise Max. The play is most poignant as an elegy for Syd Barrett, who died during the London run. It starts with Syd, a young and handsome pop star, playing pipes to Max’s daughter Esme like a modern day Pan, a reference to Pink Floyd's first album The Piper at the Gates of Dawn, the only full album Barrett appeared on. By the end of the play Syd, is a balding recluse who has been befriended by Esme’s daughter Alice. Just as Pink Floyd's music became duller and duller without Barrett, the musical timeline Rock n Roll takes us though gets worse and worse as the play progresses and we move into the eighties bombast of Guns n Roses and U2. We end in up a consumerist Britain where the masses have become desensitized, and are too numbed to what’s going on around them to want to rebel anymore. When Max reveals he considered voting for Thatcher for a moment it doesn’t come as a real surprise. After all, what could be more conservative than steadfastly clinging to outdated beliefs while the world changes around you? Everything concludes very cosily with Max and Lenka getting together and Jan and Esme finally realising their long held feelings for each other. It might have been designed as a play about radicalism, but Stoppard reinforces the conservatism of those involved. Rock n Roll ends at a 1990 concert by the Rolling Stones, hardly new or challenging music. One of the most ramshackle nights in Manchester is the monthly Jamboree, which has moved from the Klondyke in Levenshulme to Retro Bar in town. As befits a gig named after a Beat Happening song and album, the bands that play are often full of enthusiasm rather than bestowed with musical polish. The Shrieking Violets, Jam on Bread and Judy and the Blumes have all graced the stage in recent months, but February’s Jamboree was musically the most exciting so far. Andrew, formerly of Cookie Cutter, played his debut gig as Freedom Screech, making tunnels of fuzz, clattering drums and lyrics about staying in eating minestrone soup sound like the scuzzy rock n roll rebellion of Sonic Youth. Another band making their full debut was Marblekrusher, whose front man Tom Whyman proves it’s possible to be both ramshackle and pop, all over the place and a good performer at the same time. Whyman is a joy to behold, jumping up and down in excitement at being on stage. Marblekrusher start off slowly with keyboard chords, before Whyman bounces off into improvised drumming like a slowed down version of free jazz. They might not conform much to music making in the traditional sense, but Marblekrusher remind us of something - music’s ability to be fun and irreverent. They start off from the same level as a child exploring melody for the first time, even covering youtube star Olivia, 3,’s sweet little ditty Two of the Beatles are Dead. They sing ‘two of the Beatles have died, two are still alive’, which is very true. However, it can’t sound very sad when they’re singing it over what sounds like a slowed down version of that other young at heart popstar Adam Green’s Bunny Ranch. Other tunes sound like music to old school computer games set in a slightly dystopian future. Lauren’s trumpet is the magical hook holding Marblekrusher together, and makes you wonder why more bands don’t have trumpets. Marblekrusher are like a circus band, but if they were a pop group, they’d be experimental early Mercury Rev or the party pop of Architecture in Helsinki. The band plays Whyman out, singing ‘we’ll be gone in five minutes, two mintes’, until he eventually collapses on the floor as if all that musical excitement had tired him out. Winter Berries finish the night with short, sweet lo-fi folk songs, including the swoonsomly lovely Sundown.